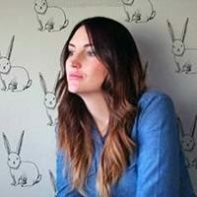 One of my absolute favorite crafters, Merrilee of Mer Mag, will be crafting for Handmade Charlotte this summer. Yay! 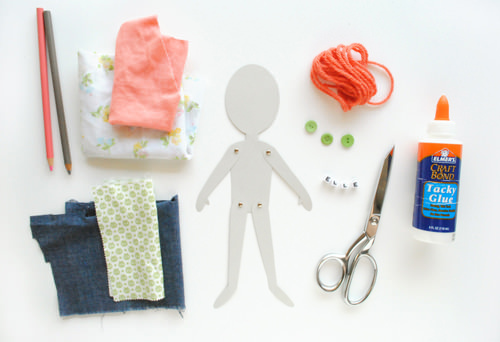 This week she’ll be sharing her take on an old classic, paper dolls. Hello friends! I’m thrilled to be working with Handmade Charlotte and can’t wait to share some of our favorite summer crafts as of late. 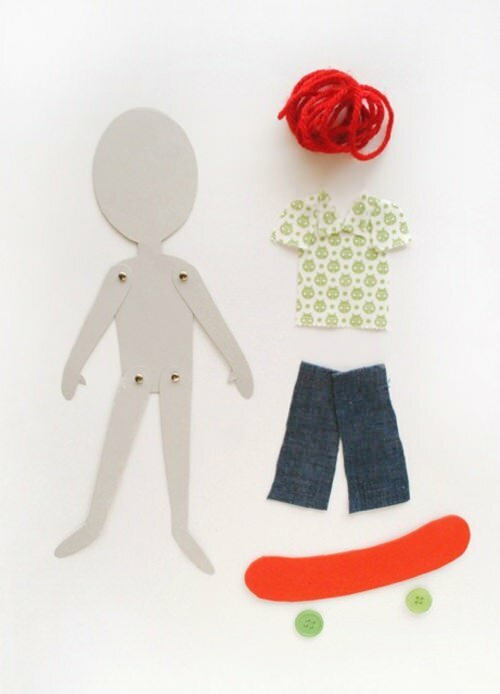 Today we’re sharing with you a simple yet super fun articulated paper doll craft to create with your Littles (or paper “action figures” as my boys call them around here). To start you will need to gather together an assortment of supplies that will help to create and customize your character. Download the template here and then print it out on an 8.5 x 11 stiff sheet of card stock. After cutting out the various parts you can then punch holes in the arms and shoulders as well as the legs and hips.Place appendages onto the body and fix in place with small brads. Now for the fun part. 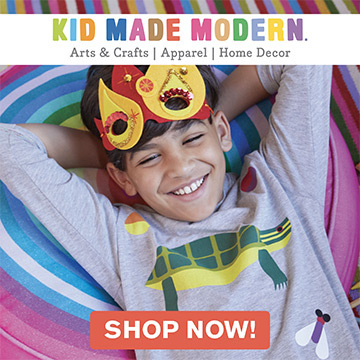 Gather your Littles together and play around with scraps of fabric, yarn, ribbon, etc. to decide just who or what you want your character to be. Feel free to add accessories and props such as this skate board. Have fun with it! The possibilities are endless. Once you have decided on and have cut out your characters attire you can start gluing the clothing on. We took the brads out for this part to make gluing and dressing our doll that much easier. Once the clothing is glued in place you’ll need to punch out holes from your clothing in the same places that you have the original holes. Once all the clothing is affixed and more or less dry, place the brads back in. Create and attach the hair (we used yarn for ours) and then draw on your face. Now sit back and enjoy your new articulated friend. And that’s it! Once everything is dry and your character is complete, you are ready for hours of play (and perhaps a stop motion animation summer cap project for the kids!?). 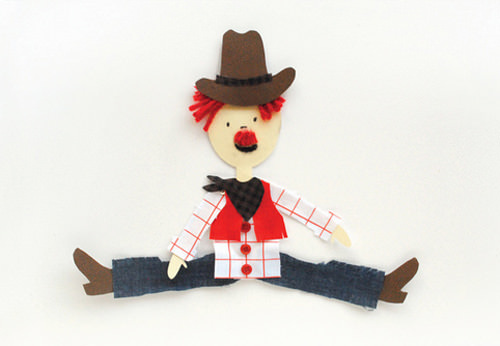 And don’t forget the make a number of friends to go along with your new paper friend such as our little dancing friend Elle, or Mr. Rodeo Clown and more! Costumed and favorite characters are a great way to go with this as well. The boys have put in an order for a pirate and Darth Vader. I have couple of mermaids on my list. Or better yet, make one to represent each member of your family! They’ll be a keepsake for years to come! 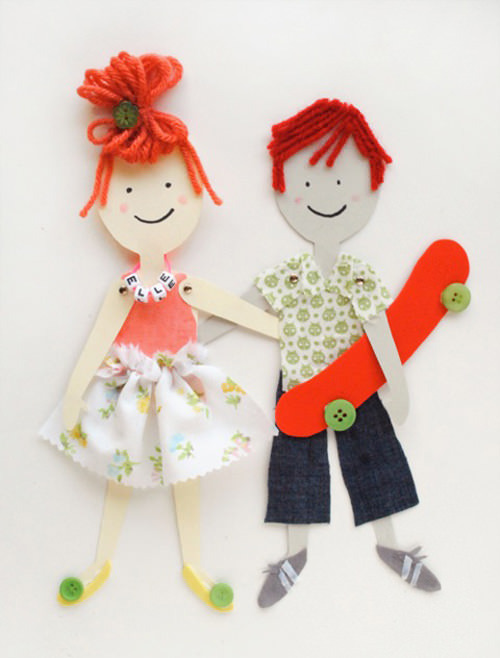 I used to love playing with paper dolls for a time when I was little. So nice to see these, thanks. 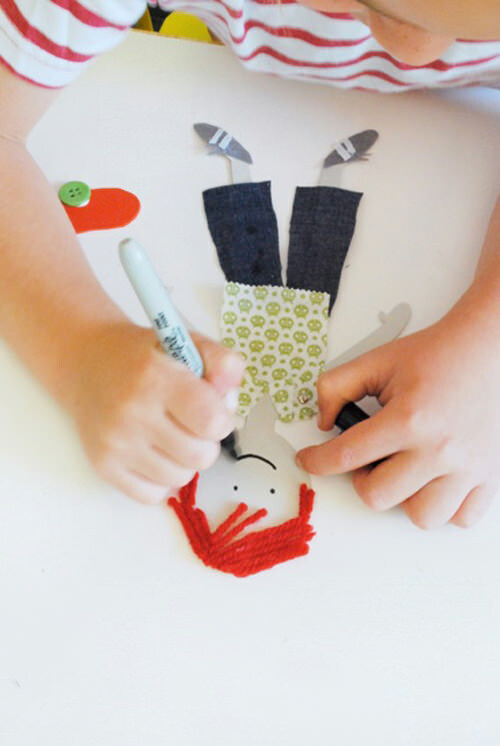 i’m totally charmed by this paper dolls!! So inspiring! Lots of dolls to makewith my daughter.Pinning! Hi! I just had to pin this too! So cute! I want to have some friends over for a crafting party and make them to send out to our other friends across the country or around the globe. Getting a sweet, customized paper doll instead of a card would be a riot! Thanks for the idea! I love paper dolls! Will have to make these with my daughter! Thank you! 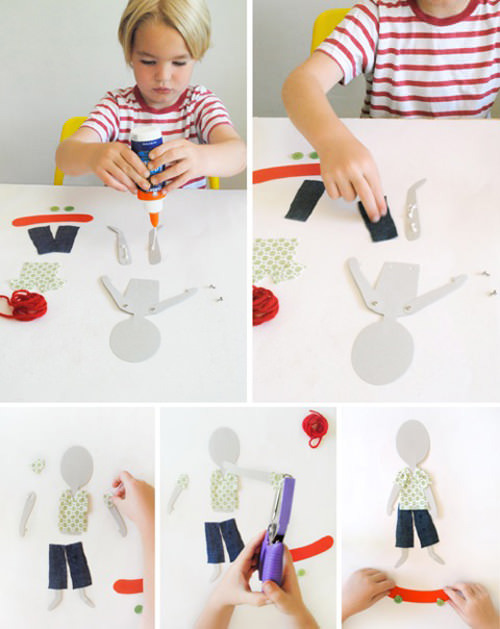 I love articulated paper dolls. You’ve come up with so many fun ways to use this template. Yes, indeed, very inspiring. 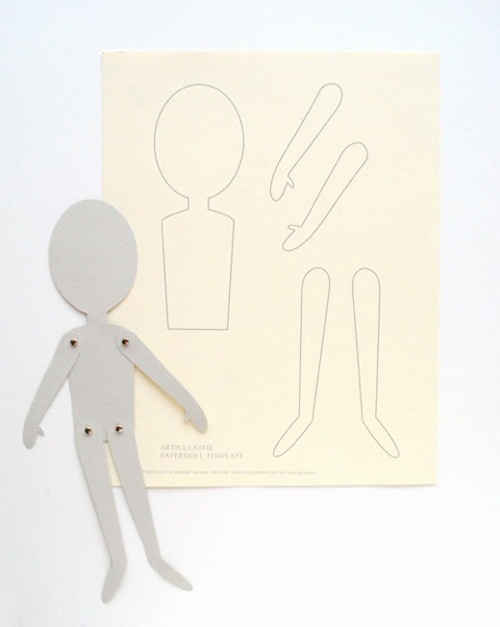 I actually find and share an articulated paper doll every week on my blog, Artist in LA LA Land. This one may be showing up there soon. Heeheeheee! glad you enjoyed the project, thanks for visiting! What are the little brads that you use like? Could you describe them please?